This post is part of our ongoing series on buy and sell acronyms. For more lingo, check out parts one and three. In part one of this series, we learned that the definition of BUMP was news to VarageSale‘s Chief Mom. So for part two, we were determined to find another term she didn’t know. This proved impossible! We even tried a trick question (“What does TAG stand for?”), but Tami didn’t buy it. Even though we did our best to convince her it stood for “tell a guy/gal,” she knew it wasn’t an acronym. Yup, she’s that good. Every now and then, a sneaky seller will post an item that she previously purchased (for less) on the same site or, yes, stole from a local retailer. Now she’s back to sell it at a higher price. Then there are the spammy posts, the downright offensive ones or those that contain links with viruses. And don’t get us started on the trolls! (Why can’t they just stay under the bridge where they belong?) 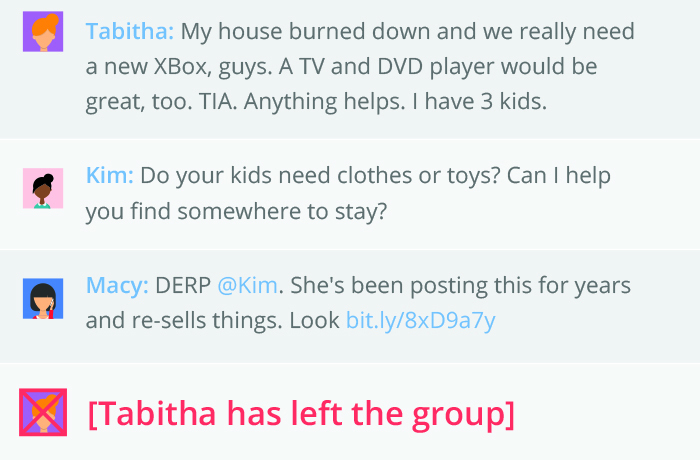 Whatever the case, DERP helps protect buyers from sketchy sellers. Tip! You can always tell who’s guilty when they suddenly disappear from the group. This little acronym can contain some pretty major psychological manipulation. 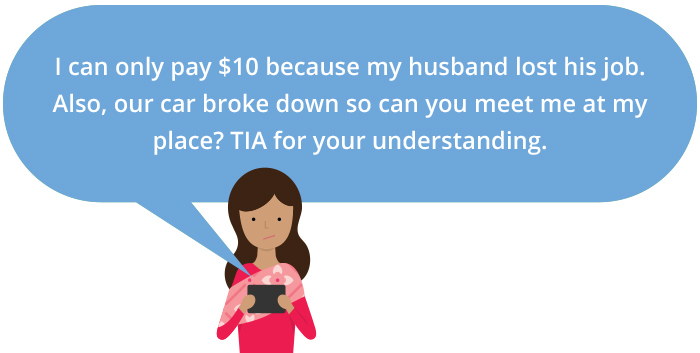 That’s right, people use TIA to play on your emotions to get what they want. After all, they already thanked you so you have to do what they want… right? I mean, they were so polite! Try saying no to that! 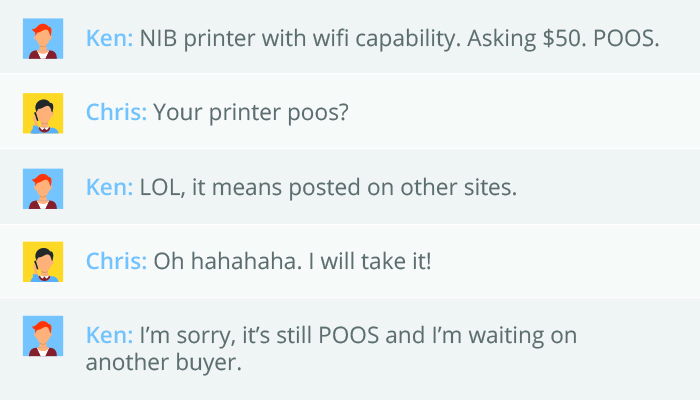 (Hint, you could always say your item is POOS. You’re welcome). This acronym can be a tad deceiving. We’ve all seen posts where the seller links to an image with an ORP of $199 and tells us they’re selling it for only $100. Did the item listed go for its ORP once upon a time? Probably. Is that what this person actually paid? Probably not! Think of it like this: Stores mark up their prices so that when they go “on sale,” it looks like a great deal. This seller is probably doing the exact same thing! Don’t try to call them out though. The conversation will go something like Nixon’s “I am not a thief” speech. Now here are two acronyms that often get lost in translation. Too many times a seller thinks that as long as the items looks new and is placed back in the box/package, that she can call it NIB/NIP. Not so. Let’s break these acronyms down to avoid any future confusion. “New” doesn’t mean almost new or kind of new, but brand, spankin’, gleaming, shiny, never-been-used NEW! “In” means the item is still IN its original packaging (not to be confused with OUT). And while we don’t need to define “box” or “package” for you, note that it shouldn’t look like it was taken apart and put back together again. Repeat after me: NIB (or NIP) means the item has never left the box (or package). The “NIB” Barbie you bought your daughter has mysterious grey hairs mixed in with the pretty blonde stuff. The jacket you adopted sets off your smoke alarm the minute you walk through the door. You need to take allergy pills 20 minutes before you snuggle up to watch a movie on your newly adopted couch. This little acronym is perfect for buyers who just can’t find that item they need around town. That moment you come across the revolutionary kitchen appliance you’ve spent months searching for? You can’t beat it. Unless, of course, shipping is free. And you thought it didn’t get any better than SFPF! Just watch out for all those people with potty mouths who think FFS means something entirely different. It could create an awkward misunderstanding. There’s a fundamental problem with these acronyms that hasn’t been discussed yet—that is, everyone interprets meaning differently. But have you ever noticed that people tend to assume their definition of something must automatically be yours? For example, some would say “excellent” means almost new, while others think that an older item is in excellent condition as long as it’s not broken. If you’re at all confused, think of it like this: When it comes to grades, A+ is excellent. That’s a whopping 95% or more! Can you honestly give your item that high of a score? Remember, if your item is marked EUC, the buyer will have some pretty high standards, and fibbing to make a sale could get you into trouble later. When in doubt, use GUC. The less you describe something as excellent, the more you’ll gain a buyer’s trust. EUC can really affect a buyer’s perception. So save it for items that truly sparkle! Speaking of personal shoppers, if you’ve ever wondered what a tag is all about, we’ll tell you! Many people tag a friend to let them know about an item they’ve been looking for. And while it’s not actually an acronym, it’s used so much in the buy and sell world that we thought it was worth defining. Tagging someone’s name is a smart way to get a seller’s attention if you want to make sure they see your post. It’s a handy tool, but beware of tag abusers! These people go nuts tagging you in every comment, demanding your attention. You’ll know you’ve met one when your notifications explode… But don’t worry, you can always block them if you have to. Well, there you have it! You’ve officially completed Buy & Sell Lingo 101. With these cheat sheets in hand, you are sure to communicate like a pro and get the best deals out there—click below to start buying and selling on VarageSale! P.S. Did we miss any buy and sell acronyms? Let us know in the comments! A friend of mine told me about her mother thinking LOL meant “Lots of Love” and wrote that in an obituary condolence on a website. She wasn’t “Laughing Out Loud” when she learned the meaning “lol”. A friend of mine told me about her mother thinking LOL meant “Lots of Love” and wrote that in an obituary condolence on a funeral home website. She didn’t “Laugh Out Loud” when she was told the meaning, ha ha lol. A friend of mine told me about her mother thinking LOL meant “Lots of Love” and wrote “LOL” in an obituary condolence on a funeral home website. She didn’t “Laugh Out Loud” when she was told the meaning, ha ha lol. If you’ve marked interested and sent a PM, but have had no responce for many days/weeks, and no longer interested because you’ve either found the same item from someone else or lost interest because of the lack of communication, how do you list yourself as uninterested? I’ve seen people say “pass” would that be appropriate? What am I suposed to do when someone says “interested” but never elaborates or pm’s me? As far as the ISO goes. I wouldn’t call it lazy. I think the search results need get better, or maybe alow people to tag search words so when that item lists they can get a notification or a result. Most people really stink at making a good title so it’s really easy to miss something you are searching for. Plus I don’t know how many times I missed something I’m looking for by a hair, and wish I knew next time when it was listed so I can snag it. Or just get lucky that someone sees it that has one or saw one listed. Anyone know what T R Y stands for? New to me. How about “cross posted” – does that mean it is posted in more than one category? I hope you do not delete this post, but can I ask, did Varage Sale sell out to a corporation? Here is why I want to know: When I started using VS it was slow but okay, and I bought and sold some items. I met some nice people and some flakes, (just like real life). Anyways, all of a sudden, now they installed that horrid button that reminds me that I sold my own item? I sent a request to the help desk, and they said…”its for your own protection of the seller” ..What? You need me to remind myself that I sold my own item after its picked up? No, I do not. Additionally, as soon as I click sold, it send a notification, which I initially thought was …”great! someone has liked my item; posted a question or wants it”, instead ..I find it its that button. So basically, I am “high-fiving myself” everytime I sell something? I asked why it also says I made $$$ in Cash. Why does VS need to keep that data on me? Furthermore, they now have “restructured and streamlined the categories”, which is another word for…..”we downsized the list because we want to run reports on what your selling, whom your selling it to and how much you charged for it”. The category list, other than for clothing, is so small, I can not find any where to post multi-purpose items….I have movers for bulky items, they fit furniture, they fit dressers, they fit desks, they will go under a barbeque….but nope…no general merchandise or miscellaneous use category no longer exists…instead the “see more” category now includes ‘real estate”????? That is not garage sale items, this is big business. I keep seeing….s/a. What does it mean?